Loving Pets is a brand aimed at making 100% natural treats for pets and high quality accessories. I was very excited to be able to review 2 Bella bowls (one in blue for Jaxen and one in pink for Ava) and their Vegitopia and Jerky Meat snacks. The bowls are really cute. They are stainless steel on the inside and plastic on the outside. They come in many different colors and different sizes based on your pets size. Also, the pups love the treats. I gave them each a pineapple ring and they really enjoyed them. Ava took about 3 minutes savoring hers while Jaxen finished his in about 15 seconds. The giveaway will be for one Bella bowl in your choice of size and color, a bag of vegetopia snacks, and a bag of jerky snacks. The giveaway is open until Midnight on Tuesday March 15th. Winner will be chosen on Wednesday March 16th using Random.org. The winner will have 48 hours to respond or a new winner will be chosen. Visit the Loving Pets website and let me know which color bowl that you would choose for your pet! -Like Loving Pets on Facebook (2 entries). i love the artichoke metallic bowl in medium! Espresso is a nice color. I Like Loving Pets on Facebook! I would choose the copper-colored bowl! I entered your EatSmart giveaway! 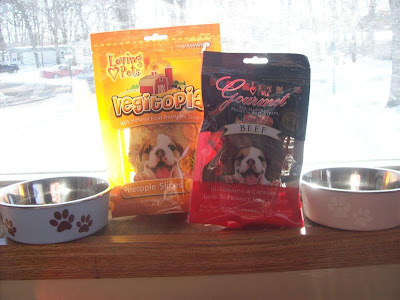 I entered your Loving Pets giveaway! I would probably go with the champagne metallic or the merlot (I'm a notorious waffler -- lol). I follow Nutritionist News via GFC. Pansy the Pug chooses the Paparazzi Pink bowl. I love the Copper Metallic bowl! I would choose the Merlot - Medium. Oooh artichoke metallic looks awesome! i entered the tavern direct giveaway!! i like the grape metallic color for my dog! I would choose Murano Blue. I would choose the champagne metallic for Junior. I would get the Paparazzi Pink! for Tinkerbell! I also entered the dali decals giveaway! Metallic grape is my favorite. I would choose the Murano Blue colored bowl. I like the champagne color. I love the Copper Metallic bowl. I would pick the Merlot. I would choose Paparazzi Pink for my dogs. I also entered the EatSmart Scale giveaway. I'd choose the Champagne Metallic bowl. Liked your face book page. I would choose Grape Metallic.